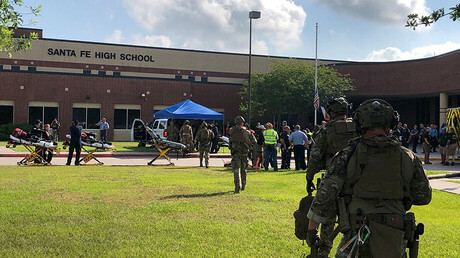 Up to 10 people have been killed at a school shooting in Santa Fe, Texas. Police confirmed that one person is in custody and a second person has been detained. A police officer is among those injured. Speaking to reporters at the scene, a police spokesman said there had been between eight and 10 fatalities, including students and school staff. A male student has been confirmed as the shooter. Images from the scene show the extent of the police presence, with students lined up outside the premises. Police confirmed that “possible explosive devices” have been found at the school and off campus. Local residents have been asked to watch for suspicious packages.